Being a destination for the best alpinists the world over, it’s easy to catch the bug of going bigger, harder, faster and lighter than you’ve ever gone before in Patagonia: Push your envelope to the edge and beyond – keeping safety in mind, but being in such a majestic place with such major objectives, they just shout at you to go for it. Safety is still a priority, and joking aside [“safety fifth” etc. ], poor decisions in the mountains here can bring with them severe consequences. 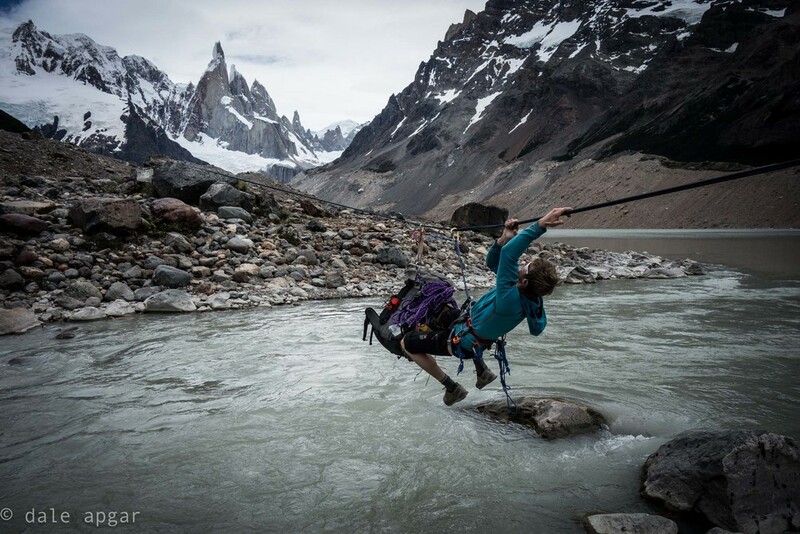 Already in the 2013-2014 climbing season, there have been three people evacuated out of Fitz Roy’s Supercanaleta route. Two women who tumbled over 200m and another male who took falling debris directly to his patella were very lucky: In both cases, between 30 and 60 people assembled near the base of the route [many of them at least WFR certified] from neighboring climbs, camp sites and as far away as town to make sure they survived. To understand the impact of this, consider the remoteness of this place: It took Jeff and I two full days of travel to get here, and for some, it takes even longer. Then you mix in the limited time and resources people have [some only have two weeks or less to get on these towers], then the paltry weather windows and wintry conditions this season, and when it takes 30 people to rally out 10+ miles and over 5k vertical feet to carry another human out to safety, the commitment is major and sacrifices are real. There are no helicopters to pluck the injured out of harms way, just man power, gumption, calories and skill. Those devoted to the rescue are great people, and reflective of the climbing community I know: all aspiring to push it, but willing to sacrifice objectives to ensure everyone gets home in one piece. With this in mind, and being ‘freshman’ to the Patagonian scene, Jeff and I have been erring on the side of caution. 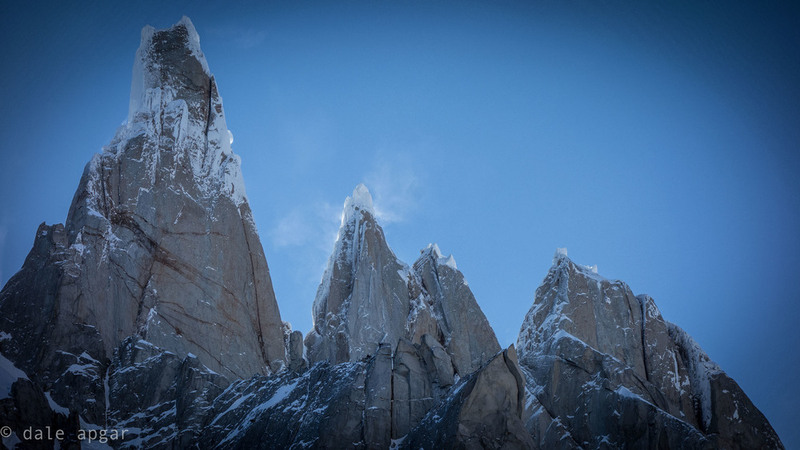 The second weather window of our time down here looked good for a try on Cerro Standhardt’s spectacular Exocet route. With the steep ice we’d enjoyed in the last couple months, and the predicted weather [clear-ish and unseasonably cold], I gathered the beta from successful parties who completed the route in the previous window. Before we knew it, bags were packed and we were headed for Niponino for a few nights on the Torre Glacier starting Tuesday night. With all the beta we gathered for the route, however, we glossed over a critical part: the approach. The guidebook said take the east side of Laguna Torre [so we did], but this year like those past the west was actually the correct path, and we paid for it. All told, we only lost an hour and change and a little mental fortitude as we traversed ridge after ridge in sideways-rain conditions that weren’t tapering, but it wasn’t death defying and we were making progress, so we stopped, refueled on chocolate chip cookies and gu, chalked it up as a character-building exercise, and persevered through the weather. The rain turned to snow upon arrival at Niponino and because weather didn’t improve throughout the night, departure time Wednesday was pushed back well after dawn to recon the approach to Col Standhardt and be confident we could hit our time splits. What we experienced Wednesday afternoon was one of the reasons why this place is so popular: The best weather in two weeks afforded views of the Torre and Fitz Roy Massifs from the Torre Glacier and they are breathtaking, destroying desire to crawl back into a tent or bivy or even to go back to town unless you have to…or unless the weather turns sour…which it did…again. After an early dinner, we tried to get some sleep before our 00:45 wakeup, but as we both listened to the snow pelt the tent, we knew we wouldn’t sleep much as we alternated between dozing and being alert enough to hope we at least had an opportunity for success in the morning. In some sections, only 3” had fallen, but wind transport was significant, loading slopes between 35° and 50° for 100’s of meters in breadth. Probing with a pole had long sections of the couloir with over 12” of new accumulation. Forecasted clearing during the day could create thermal instabilities in the new snow given the middle of austral summer and direct exposure. Upper snowfields on the route were of similar slope and aspect, so any concerns in this area could be amplified by even more exposure, consequence, and lack of anchors. Consequences of a slide were fatal: being buried was less of a concern than being swept over rock bands in either the couloir or the route above. It was decision time: We arrived at the designated part of the approach where we would leave one pack with excess supplies and commit to the last steep slopes of the col, and at least the first few pitches of the route. I’ve never been in a climbing position where avalanche evaluation was required, and Jeff and I left our avy equipment in the US not expecting such accumulation in the Austral summer. If I was to ski this slope, only the most confident of pits or extended column test would alleviate my concern for a slide. I used a pole and the adze of my tool to create as best a column as I could but still was not convinced that a sluff or slab could release and send one of us – most likely both – skipping down a couloir and tumbling over a cliff greater than 100’ in height into a further crevassed glacier. A side: At this point we’re two weeks into an international climbing trip where we’d summitted nothing yet, only finished the business of one route, had a tent nearly collapse on us in strong winds, rain, sleet and snow and spent more of our rare vacation days festering in town pouring over meteorograms and our chosen books than we care to remind ourselves. We were frustrated by our foiled day of reconnaissance by snowfall and the maze of crevasses that would swallow a Charleston Single and because of our early morning stroll we were already over two hours behind schedule and behind a party on a single-party ice route. I don’t know the look in my eyes but that of Jeff’s was not good. The objective risk of what the snow could or couldn’t do in the couloir and the snow fields above was too much for me to neglect. Both of us wanted any bit of the route, but the rest of the approach and descent were not getting any better. Down we went. 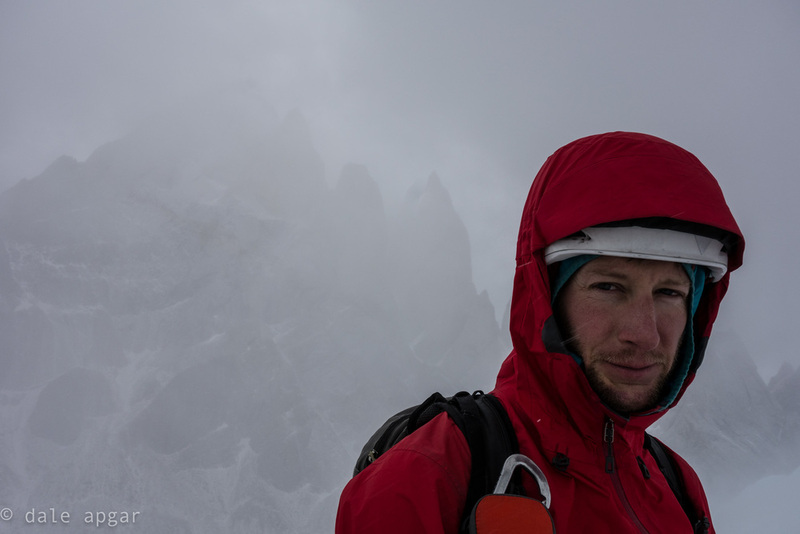 The weather did as we expected – we were afforded views of the massifs that make dreams and images I’ll have for life. The temps stayed cold – surely making the ice pitches even better in that gully and we watched the progress of the other group on the route’s snow ramps as the clouds continued to part revealing Cerro Torre and her intimidating neighbors in front of blue skies. 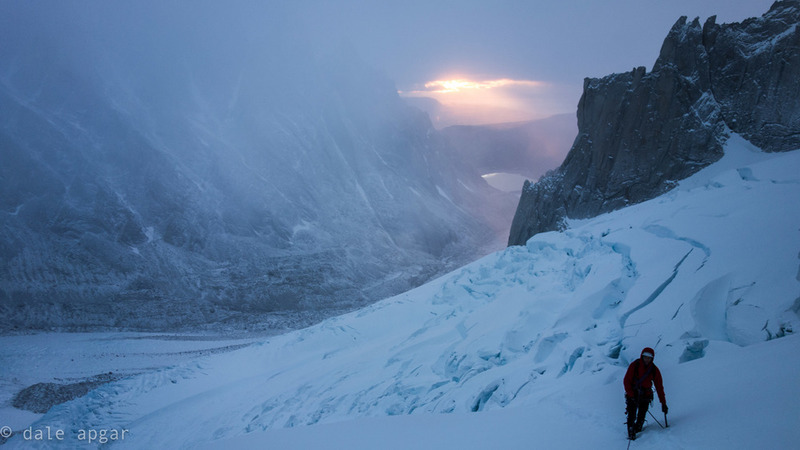 The summer sun was intense, though, and within hours slopes started shedding the new accumulation onto the rock and glacier below – a scene expected from the earlier evaluation and affording some support of decision made to retreat. But still the “what-if’s” persisted. As we stopped along the descent of the glacier to nap and take in the views, there were plenty of opportunities to wonder if continuing would have brought glory or something much worse. The line is absolutely stunning, and with two men working across the face to the appropriate gully, we now had a much-needed scale for how to judge the size of these towers. 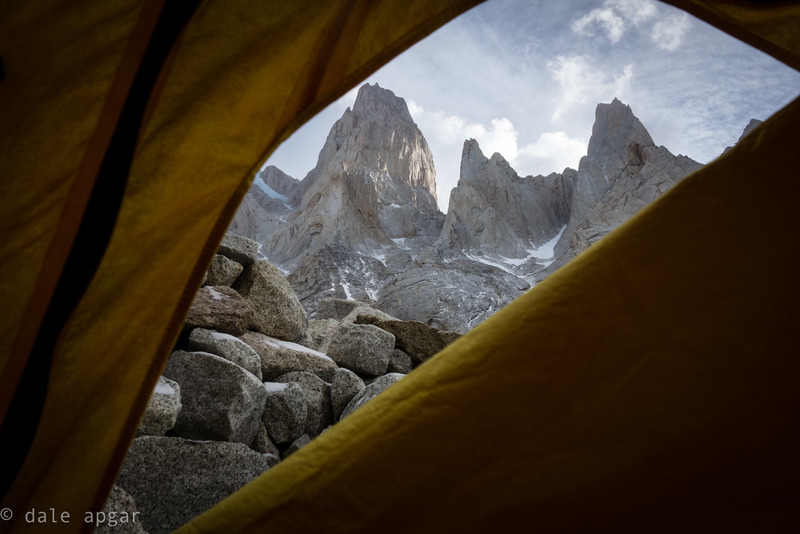 They are immense – simultaneous feelings of intimidation and inspiration, and all the more stinging that we weren’t at least giving the upper pitches our best shot. Perhaps I was too quick to judge the rest of the couloir unsafe: The team ahead of us continued and were then in the business. Sure it’s not always the first group that triggers a slide, and that played into the decision making, and perhaps more knowledge of the snow and how the storms here track, I would be much more confident in the slope if put in the same position in a future attempt. What if mid-way on the upper slope the sun peaked out, and one of my or Jeff’s tracks triggered a major slide? Such a scenario would be fatal. As all the travel and frustration of the trip up-to-then came to a head, and the last week of our travels later showed no sign of great climbing weather, meaning we might look at an entire trip without a summit, that’s a large, bitter pill for anyone to swallow. But I know this: I took a lot of pictures, saw amazing peaks, was inspired, learned a lot and enjoyed the entire 72 hours it took for that mission, I’m sitting here typing now, healthy, with only a hotter burning fire to get back to Exocet and stand on Standhardt’s rime mushroom summit as well as learning more about the conditions and situations this range presents. Hindsight is always 20-20, and that was a tough call at that rock band: Could we have sent? Maybe, but when your instinct tells you ‘no,’ and nothing you’ve done or can do will reverse that instinct, what are you to do?